of shoppers have discovered the value, selection, and expertise SkinStore offers.What makes Skinstore different? Incomparable Selection. Thousands of products and solutions to address virtually every skin concern, including anti-aging, acne, scars, sun damage, lip enhancers, hyper pigmentation, psoriasis, eczema and rosacea. Shoppers can also find the basics-moisturizers, sunscreens, and bath products-along with hair and nail care products in their comprehensive selection. Unbeatable Prices. Bulk-buying and low overhead enable SkinStore to offer among the lowest prices anywhere. SkinStore UCS is pleased to offer full traceability as one of our shipping . At checkout, please select UCS as your shipping method . To earn cash back you must place order the same day that you click to the store. 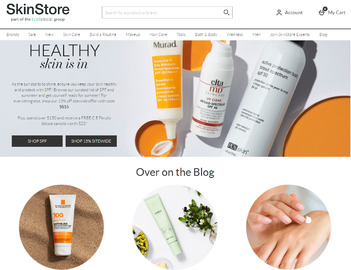 Click a Coupon or click Start Shopping to earn 12% Cash Back at SkinStore. 25% off Exclusive Partner List!